Since its publication in 2001, You Are My I Love You has sold half a million copies worldwide and given voice to the unique love parents feel for their children. Now the creators of this modern classic reunite to honor the special bond between grandparent and grandchild, the one of passing along tradition, joyful spoiling, nurturing imagination, and pure adoration. Whether it's the sharing of stories or romping horsey rides, silly tickle fights or lazy fishing trips, there's truly nothing like it. 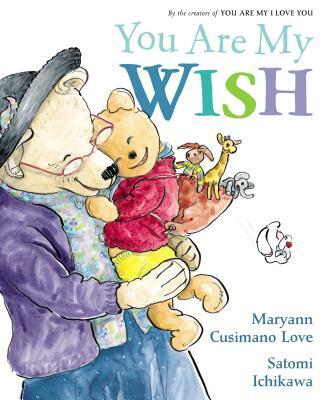 With touching, heartfelt words and warm, playful illustrations, Maryann Cusimano Love and Satomi Ichikawa shine their spotlight on this unique relationship. Maryann Cusimano has been working with children since she was a teen–as a clown, story-teller, singer, puppeteer, and caregiver. You Are My I Love You arose out of her work with children, especially the PeaceKids group in the Sursum Corda housing project. Maryann lives in Washington, D.C., with her husband, Rich Love (they are newlyweds). She is an associate professor of international politics at Catholic University. Dr. Maryann Cusimano Love is an award winning international educator and author. Dr. Cusimano Love has spoken to audiences from suburban pre-schoolers to inner city teens to international diplomats. A winner of Harvard University’s Pew Faculty Fellowship for teaching, and Catholic University’s Teacher of the Year Award, Maryann Cusimano Love is an effective presenter who favors participatory techniques. Satomi Ichikawa, creator of the Nora books, lives in Paris, France.